Don't you hate it when you are scrolling through an album in your playlist, only to find out that one of the tracks is out of order? Or that it left out some essential things, like Artist? 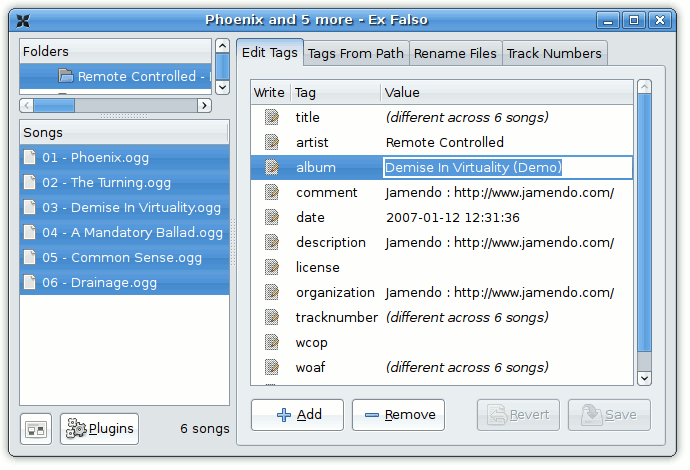 Fix those problems with Ex Falso, a simple, fast, and powerful tag editor for OGG, MP3, FLAC, and others. Simply browse to a directory where your music is stored, and select the songs you want to modify. It even includes a way to set your tags based on the filename, or the other way around: rename your files based on the tags. The Track Numbers browser is also handy; with it you can order your songs and have the appropriate tracks set with one click. Ex Falso is bundled with Quod Libet, but you may download it as a separate package.